Construction sites are definitely not open to the public, and temporary fencing offers the perfect way to give workers privacy and keep foot traffic from impeding upon a construction project. There are many different materials that can be used to build effective and durable temporary construction fencing, including PVC, aluminum, and chain link. It is even possible to install security gates if a construction project needs to be kept secure from intruders. From weddings and galas to concerts and corporate picnics, there are many different social events that occur in public on a regular basis. Chances are that the attendees at those events would appreciate privacy and separation from the general public. 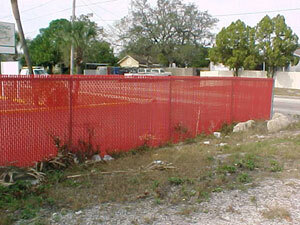 This is the perfect use for attractive temporary fencing that serves its purpose and can be deconstructed the next day. Renovations occur throughout cities and towns on a regular basis, and many of them involve digging up pipes, laying new foundation, building with heavy machinery, and other dangerous tasks. It is essential that members of the public cannot wander onto renovation sites and hurt themselves, so temporary fencing plays an important role in ensuring public safety. West Florida Fence is proud to offer a large selection of temporary fencing that can be customized with a variety of materials, sizes, and structures to accommodate a wide range of needs. The construction fencing materials used by West Florida Fence are even backed by generous manufacturers’ warranties to prevent extra costs in the future. Call (813) 251-5883 to request a quote and learn more today!